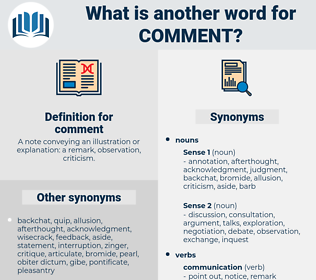 What is another word for comment? A note conveying an illustration or explanation: a remark, observation, criticism. considerations, arguments, Suggestions, critics, sightings, Ideas, media, Drives. data, graffiti, consideration, criticism, reflection, sighting, point, 'observation, word, assertion, clarification, intervention, suggestion, attention, reaction, speech, indication, argument, assessment, affirmation. concerns, elicited, advised, proposed, received, Provided, Occurred, expressed, Believed, made. pointing, complying, spotting, Adhering, shadowing, sensing, seeing, marking. noticed, described, Notified, suggested, Adjourned, said, used, attached, Stalled, seen, required, Meant, made. points, actions, monitors, advises, observes, results, holds, Does. speak, pronounce, notices, mention, respond, react, criticize, intervene, dwell, point, touch, discuss, concentrate, attach, confirm, decide. heedlessness, silence, quiet, ignorance, neglect. ignore, mystify, keep quiet, obscure, miss, hide, overlook, refrain, confuse. So should her money be, - as regularly and mechanically supplied as the dinner, exciting no more comment and needing no more argument. Johnston followed him, too much surprised to make any comment. 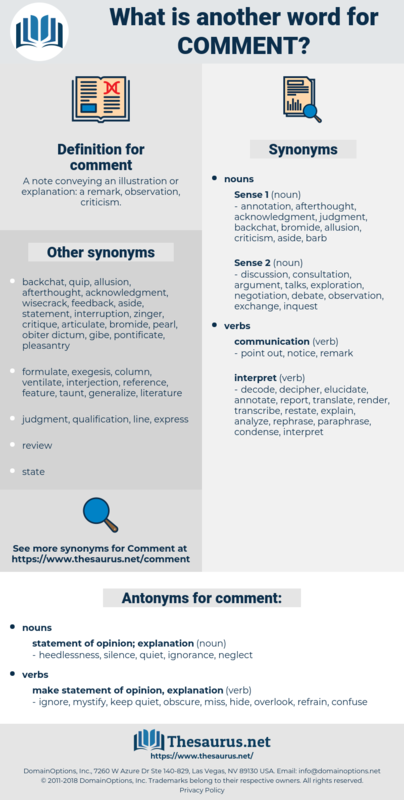 cliche, barb, jibe, gibe, conversation stopper, banality, rib, ad-lib, slam, courtesy, shot, quip, sally, mention, crack, reference, gambit, observation, wisecrack, obiter dictum, bromide, stopper, shaft, platitude, commonplace, zinger, reflexion, reflection, passing comment, ploy, dig. criticize, second-guess, knock, pick apart, disc-jockey, kibitz, criticise, kibbitz, dj, disk-jockey, wisecrack. explicate, note, mention, explain, observe, remark.